I came across a great post today over on the Read Scott blog dealing with different philosophies for corporate worship. I would have to say that GracePoint falls into the “Album Corporate” category. In general, songs are chosen more for fit and relevancy than for consistency in style and familiarity. (While the songs are chosen more for fit, I think the style is pretty consistent…) New songs may, or may not, stick around. However, we are making a point now to repeat new songs quickly in order to improve familiarity. We are also definitely a “keep them on their toes” kind of church. The interesting thing is that I don’t think there has necessarily been any specific vision to be this kind of church. Style – yes; corporate worship philosophy – no. It seems to have just happened. Probably due more to band boredom with repetition than a well-thought-out plan. Any GP’ers care to comment? Or non-GP’ers, what about your church? Earlier this week, I came across a great post called “Raising Up the Next Generation” over at the Worship Together blog. Not exactly sure what caught my attention, but I “pinned” it in my bloglines feed and I’ve been referring back to it every day or two. This morning at church, something happened that reminded me of the post. Jake is a middle-schooler (age 13?) who serves on the GP Productions team at GracePoint. He doesn’t just hang out with the tech team, he actively serves! More on that in a minute. Can you imagine how Jake must have felt to to be asked his opinion? What a self-confidence boost for this young man! I think Jake has been serving for about a year now. Every Sunday, he is there at the break of dawn to unload the trailer and help set up the video equipment. He’s also one of the last people there each week helping with teardown. At first, I would see him shadowing people on Sundays. Then he started setting up projectors, directing people backstage, etc… A few weeks ago, I even saw him running the video switcher during the Sunday services! How ridiculously cool is that? He has more responsibility than most people on Sunday mornings. Shawn, I really applaud you for (a) recognizing the talent, commitment, and potential in this young man, and (b) for be willing to mentor him, to train him, and to allow him to serve alongside the “big kids” using some really expensive equipment. I was reminded this morning that I was in the same situation when I was Jake’s age. Rick ran sound at my church every week. He allowed me to sit with him each Sunday, and taught me how everything worked. Eventually, he let me run sound unassisted when he was out of town. I was probably 15 or 16 when that occurred. Thanks Rick! We recently auditioned a 17-year-old young lady named Tera to sing with Edge of Grace. This will be the first time that a student has ever been in the band. I hope to follow Shawn’s lead in helping her to learn to lead others in worship. Take a moment to read the Worship Together post, and think about how you can apply it in your ministry or organization. I’ve been playing around with Planning Center Online, trying to decide if we want to switch to it. I discovered their Ministry Centered blog today. The most recent post listed the top 30 songs used for Easter. At GracePoint, we used #3 My Redeemer Lives, #23 Let God Arise, and #24 Salvation is Here. 3 out of 5 ain’t bad. I’m surprised that Linkin’ Park’s “What I’ve Done” wasn’t on there… That was our offering song. Some miscellaneous things that I stumbled across this week. Jeff has some great, ahem, tips? for selecting your next guitar rig. In general, I plan to avoid blogging on politics; but this was just too funny to pass up. Hilary under sniper fire in Bosnia. I’m a huge fan of satire done right. This video is pretty impressive. It remains me of the old Michael Jordan/Larry Bird commercials for McDonalds. 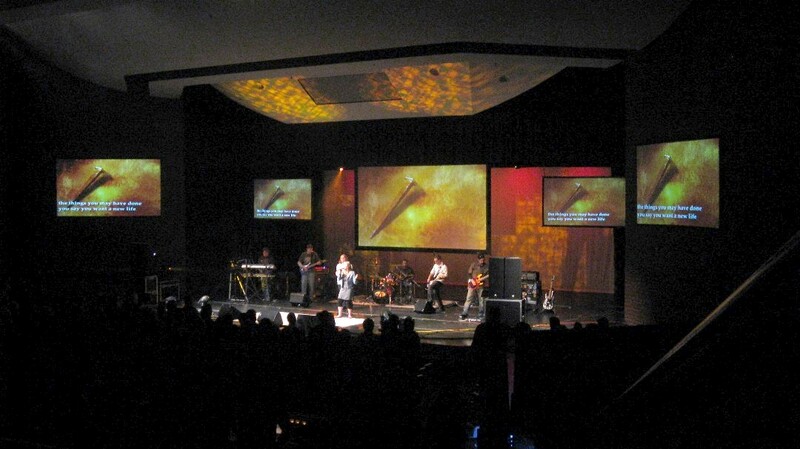 Scott has a great post about creating a worship environment. I came across this bit of amusement on the message board of the Mandolin Cafe. I’ve never blogged about the cafe, but it’s the online hangout for mandolin players and a great source for all things mandolin. My wife and I were planning to fly from London to Orkney to spend some time with my Dad on his birthday so I phoned my mother to ask what he might like. “Well”, she said “he really wants a Mandolin”. “A Mandolin?” I asked to make sure I’d heard her correctly. “A Mandolin” she confirmed. Now, I have to admit to being slightly perplexed as to why my Father, in his early 70’s, would suddenly have a craving for a stringed musical instrument but he had played the guitar when I was growing up and it seemed like a nice hobby for a man to enjoy in later life. I found a lovely man in Kent who sold said instrument and spoke to him on the ‘phone to buy one for my Dad. He seemed overjoyed that someone else in the world had decided to take up this wonderful instrument. He wished my Dad well and said he shouldn’t hesitate to call if he needed some tips. So after an enjoyable conversation, I paid the man and awaited delivery of my Mandolin. It arrived the very next day in a rather large, odd shaped box and I couldn’t wait to see my Dad’s face when he saw it on his birthday. My wife and I jumped on the plane to Edinburgh on the first leg of our journey and I carefully placed the Mandolin in an over head stowage unit. So far, so good. Now the planes from Edinburgh to Orkney are slightly smaller than the jets that connect Britain’s capital cities. Not so much over head stowage unit as hat rack. I spent the rest of the journey jammed into my seat with a Mandolin making life rather unpleasant. By the time we arrived in Orkney it had a less than favourable nickname. But I consoled myself with the fact that it’d be worth it to see my Dad happy. We met my parents at the airport and my mother asked “What in god’s name is that?”. “It’s Dad’s Mandolin” I whispered. “Oh, it’s bigger than I expected” she replied. And that was that. No more was thought about it as we spent the evening catching up over good wine and food. On the Saturday morning, I was chatting to my mother again and asking what on earth had made Dad want a Mandolin. Her answer will stay with me for the rest of my days: “Oh” she said “he saw it on Ready, Steady Cook”………………………………………. It was at this moment that I learned that a Mandolin may well be a small stringed musical instrument but it is also a cooking utensil used to slice things very thinly indeed. My father, the culinary enthusiast, had wanted one and what I had bought him would not be much cop in the kitchen. So the blasted thing made its way South again and has sat in our spare room ever since. The nice man in Kent seemed so happy when I bought it that I couldn’t bring myself to tell him. So there you have it, if you have an urge to play the Mandolin and my story has brought a smile to your face, bid away. It deserves a good home. In case you’re interested, here’s the link to the message board post with more amusing comments. Check out this great post from Jeff Miller over at Consuming Worship. Jeff contends (and I agree) that worship is more than just music and singing on Sunday mornings. Thanks for the insight Jeff. Lately, I’ve been looking for some new music for Edge of Grace. But I’ve been kind of specific in my search. We have some incredible female vocalists in the band, but most of the songs that we’ve done over the years have been led by a dude. We’ve done some great songs with the ladies, but it’s probably a 15%/85% ratio overall. Or even less! Based on the talent we have, I feel like the ratio should be closer to 50/50. But the problem is, we’ve had a lot of trouble finding great rock songs with female vocals. There’s simply far more great songs out there for the male voice. So I’ve been on a search lately for some great “chick rock“. Songs that can hold their own against the other stuff we do. After months of searching, I’ve compiled a list of 28 songs that I’m asking the band to listen to and give me feedback. Particulary the ladies. You are currently browsing the From The Mind of MandoRon blog archives for March, 2008.